Tuna Melts for Beating Depression?!! When I start feeling low during a rainy winter in western Canada, I make them for lunch! My boys love them too and so they're great for their own mental development. This recipe combines the seafood with healthy tomatoes and celery - more powerful weapons for your mind. 2. In a bowl, mix the tuna, mayonnaise, oregano, lemon juice. Season with salt and pepper. 3. Place the rye bread slices on a baking sheet, and broil 1 minute in the preheated oven, until lightly toasted. Remove from heat, and spread with the tuna salad. 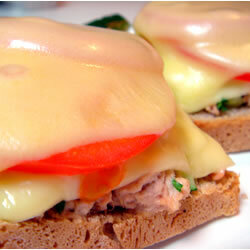 Place 1 cheese slice over the tuna salad on each piece of bread, layer with a tomato slice, and top with remaining cheese slices. 4. Return layered bread to the preheated oven, and broil 3 to 5 minutes, until cheese is melted. Join in and write your own page! It's easy to do. How? Simply click here to return to Seafood Recipes.